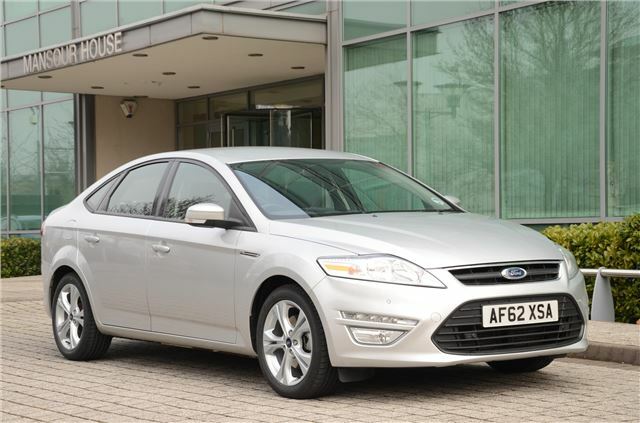 Ford has announced lower-priced and upgraded versions of the Mondeo range, including two new series aimed maintaining sales following the news that the UK launch of the all-new model has been put back to the end of 2014. The new entry-level Ford Mondeo Graphite range kicks off at £15,995 for the 1.6-litre car, around £2100 less than the previous lowest-priced model, the Edge. Also a new Business Edition of theTitanium X has been rolled out. The new Titanium X Business Edition has more equipment than the outgoing Titanium X, despite prices being £1500 lower for the new model. The 2.0-litre Duratorq TDCi also receives some updates. Thanks to some clever re-tuning, output has been reduced to 119g/km for the hatchback and 120g/km for the estate, across both 140PS and 163PS power outputs. This is a useful reduction of up to 10g/km across the board. Fuel consumption is also improved from 57.6mpg to 61.4mpg. This change means the 2.0-litre diesel Mondeos now qualify for annual road tax (VED) of £30, down from £105. Here's a full run-down of the equipment packages for both cars. It's the New Mondeo that i'd like to see launched , rather than tweaking the current one. Any update on when the New Mondeo will be going on sale ?